DC Entertainment underwent a Rebirth. And it was good, offering comfort food to superhero fans. Over at Marvel, there was a Secret War, then a Civil War, too (or II). And though the latter event isn’t quite over yet (and maybe not as well received), the results of it are good — just not comfortable. Where DC has listened and tried to give fans what they wanted — a truly heroic Superman who knows the example he must set, a powerful Wonder Woman confident in herself, a driven Batman who has also learned that he is not alone, plus many more familiar versions of old favorites — Marvel has doubled down on uncertainty. It may not sell quite as well, but right now, the publisher is taking risks with its superhero storytelling. These aren’t “comfort food” books, though one is fun at times. They’re books that offer hope, but also make it clear that hope has to be matched with effort. The one that should be getting the most attention and may not have is Occupy Avengers, by David F. Walker and Carlos Pacheco. As mentioned on our podcast this week, the title might have actually detracted from its quality, in that it feels like Avengers overload. But look again. Likely written in the early days of the Standing Rock protest, the book has only gotten more vital — and the second issue isn’t even out yet. 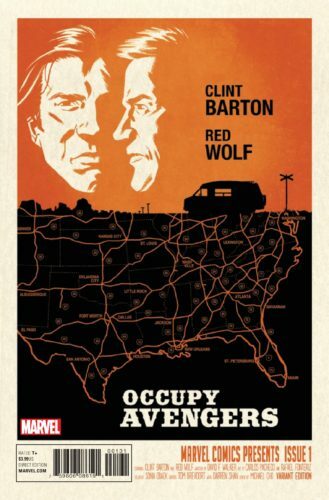 In it, Clint Barton (Hawkeye) is wandering the country, alternately trying to find and hide himself after being acquitted for the murder of Bruce Banner. Many of his fellow superheroes spurn him, though Banner himself had tasked Hawkeye with killing him if it ever looked like he was going to Hulk out and cause damage again. But the people in the heartland of America? They love him. He took away one of their boogeymen by ending the menace of the Hulk. He’s torn. He’s feeling guilty. And in a small town, he finds injustice, with a corporation moving in on tribal lands. Sound familiar? Of course, this plot has to include a supervillain, but it’s the kind of story that makes you wish that we could have costumed heroes arise and take on these issues. 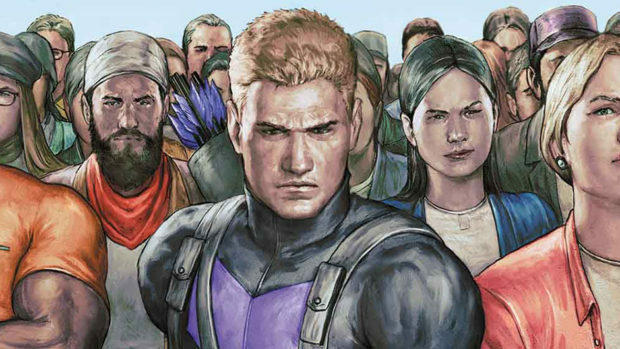 Hawkeye also crosses paths with Red Wolf, and it looks like the two are going to be shaking consciences from issue to issue. It’s great that there are heroes protecting Earth from alien invasion, but who’s protecting us from ourselves and our greed? This has the potential to be the “Hard Traveling Heroes” of the 21st Century: talking about the complexities of what’s really going on in the United States while also pointing out that the heroes have to be us. We don’t really have a Red Wolf or Hawkeye; and ultimately, my memory tells me that Green Lantern and Green Arrow didn’t really solve as many problems as just make readers think in Denny O’Neill and Neal Adams’ classic run of the 70s. With this, Power Man and Iron Fist, and the just ended Nighthawk, Walker proves that he’s a writer who loves superheroes but isn’t going to let us off the hook with simplistic power fantasies. Because it’s also clear that the old fantasies aren’t working as well, Marvel’s newest team of young heroes turned their backs on avenging. They, too, are about dealing with real issues and making a call to action; they are Champions. 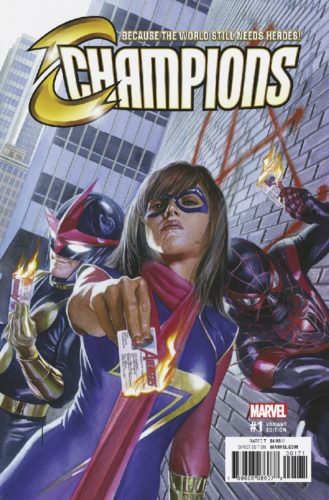 In the first issue by Mark Waid and Humberto Ramos, the Young Adult heroes of the Marvel Universe slowly band together seeking justice and trying to keep avenging from being necessary. Ms. Marvel, Spider-Man, Nova, The Totally Awesome Hulk, Viv Vision — they know there has to be a better way. The book also isn’t candy coating things; though the second issue focuses on the team trying to bond on a camping trip, the first issue covers them disrupting a human trafficking ring. Sure, there’s a supervillain in this version, but don’t be fooled that it isn’t happening in real life. One of Marvel’s classic characters also wants to offer hope. At least for himself. 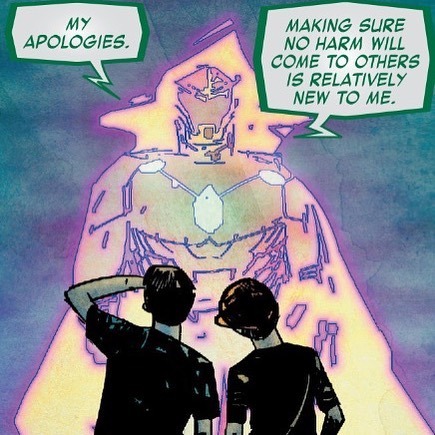 In the wake of both Secret Wars and Civil War II, Victor Von Doom has an unscarred face but not an unscarred reputation. 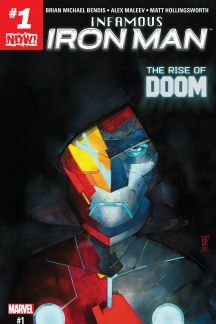 Brian Michael Bendis and Alex Maleev bring us Infamous Iron Man, the hero formerly known as Doctor Doom. While so far the book is being cagey about Tony Stark’s fate, it’s clear that he’s not around, and Doom plans on taking his place. Is redemption possible when most people remember that you’ve spent most of your life in an arrogant pursuit of power? At its best, Bendis’ work is a bit elliptical, slowly doling out the answer to your questions and sometimes backtracking on itself to create a resonant arc. Reuniting with Maleev, who teamed with Bendis on their seminal Daredevil run and Scarlet (which would probably reward revisiting about now), Bendis is at his best. They’ve got a big idea on their hands, and I’m looking forward to the discussion this book should spark — both nerdy ones, because of course the Thing is upset about Doom as Iron Man, and philosophical ones. Is redemption possible? As all these comics remind us, we have to have hope.